scope: Bespoke furniture design and supervision of the construction. 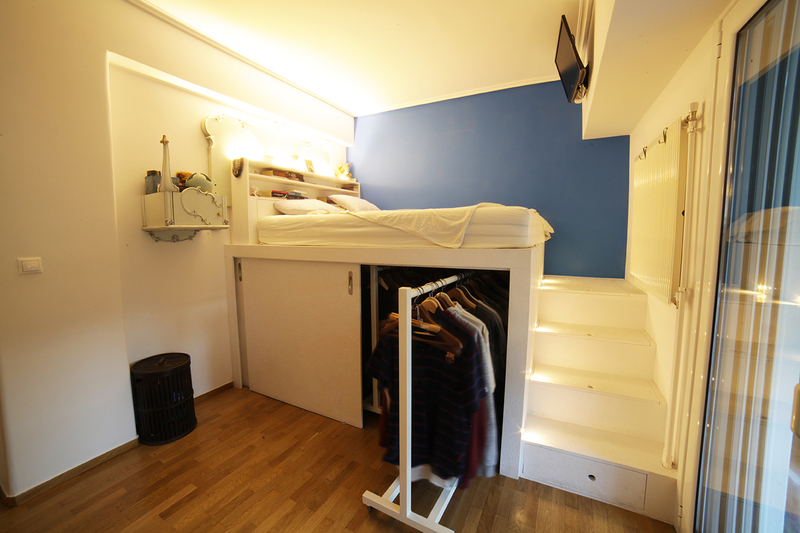 construction: Bed loft with closet, StairCase: storage space with drawers, cupboard and WareBed: bedside – furniture with lighting, 2 open shelves, 1 big reclining cupboard and 2 schuko sockets for the installation of 2 small lamps. materials: Metal bed loft coated with OSB and storage bed and staircase made of OSB (oriented strand board) 18mm thick. All final surfaces coated in wood primer and water based white paint. Construction of the interiors of the storage spaces (drawers, cupboards, closet) with white melamine.